A surprising limiting factor in some parts of the desert is too much moisture. Wait, you say, I thought deserts were too dry? Because there’s usually so little rain, nobody is really prepared for much. So even what might be considered a light rain elsewhere can be enough to flood out desert burrows, nests, hollows, and lowlands. If you are a creature who can move fast, or a plant that can hold its breath, you will get through it. But even in the desert, rain is not always light. During the summer monsoon months, and a few other times of year, there can be heavy downpours. And adding to the effect, there’s that old caliche we talked about before. This is the impervious layer of minerals and clay that forms over time a short distance down under the desert surface, and acts as a water-trap. The water can’t sink in–so where it can, it slides off downhill. With a light rain, you can suddenly get a flash flood. With a heavy, or extended rain, you can get massive dangerous flooding, the kind that kills animals, large as well as small, and washes away trees and cars and buildings. In the middle of many human habitations in the desert, you will find long empty wild spaces, often called “washes.” These are where the flash floods wash through, carrying away whatever is in their path. It’s strange, when you think about it, how moisture could be a problem, and a limiting factor, in both directions in the desert. Or maybe not. Because a lot of living things want conditions that are not too much, or too little. Instead, they want things to be generally within an agreeable range. So when you look at a limiting factor, it can be fun to check if there is another one lurking at the opposite side. Yet another mystery. Posted in Biology, Desert, Fauna, Flora, Geology, Limiting Factor, Monsoon, Rain, Sonoran desert, Water, Weather | Tagged claiche, flood, monsoon, rain | Comments Off on Too Wet! 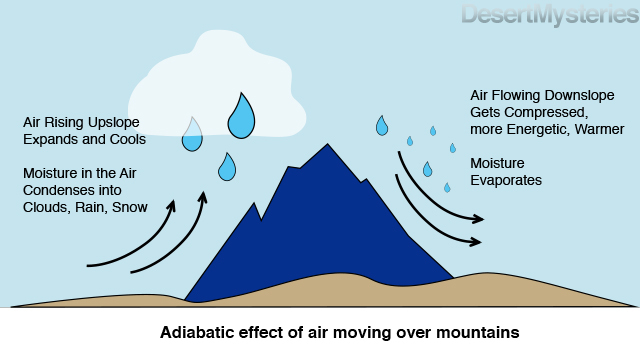 If you listen to the explanations given by weather forecasters, you may have heard the word adiabatic. No, it’s not a disease related to blood sugat—that has a BET in the middle, not a BAT. Instead, it is one very cool reason that storms suddenly pop up out of a clear sky in the desert. Adiabatic cooling or warming happens when the pressure on a blob of air increases or decreases. When desert air hits a mountainside and rushes up the mountain, the air expands, gets “thinner” and cools as it rises to a higher elevation. This means that if there is any moisture in the air, there is less energy to keep it suspended, so the moisture is more likely to condense, and form rain. The opposite happens when air flows downslope—it warms as the pressure increases because the molecules are closer together and bump into each other more. Maybe that is one reason that places east of mountains in North America are often more warm and dry than places to the west of mountains. Not only does the moisture get wrung out of the air on the western upslope, even very wet air from the ocean, but following that, some of the moisture on the downslope gets absorbed back into the falling, compressing, warming air. Or rather, cool, then warmer and drier! 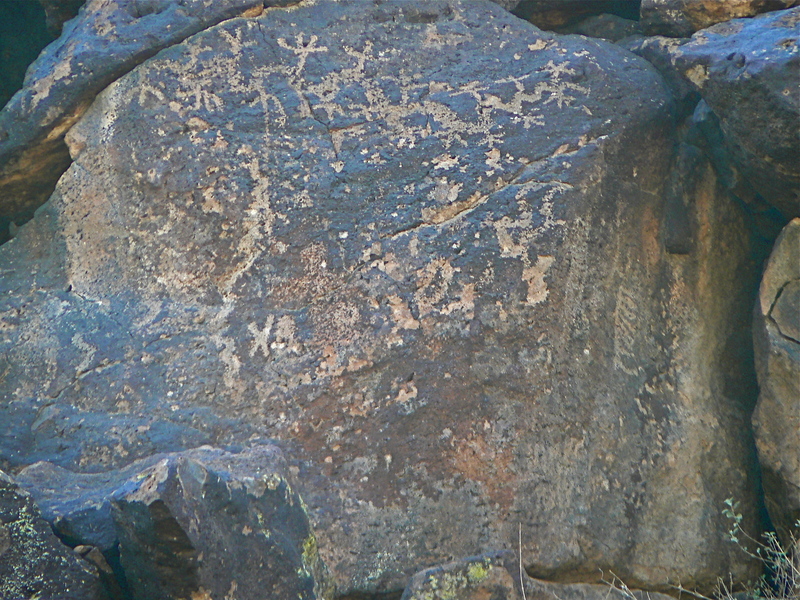 Posted in Desert, Geology, Heat, Rain, Sonoran desert, Water, Weather | Tagged adiabatic, Moisture, precipitation, rain shadow, Weather | Comments Off on Adiabatic—a what? The definition of desert is a dry place. So what do you mean, desert wetlands? Like most things in nature, deserts are more complicated, and interesting, that you’d think at first. Because they are such a distinct change or edge, they often host a surprising variety to wildlife, including disjunct species, that is, organisms typically found in distant areas. This also means that they are often good places to view wildlife. 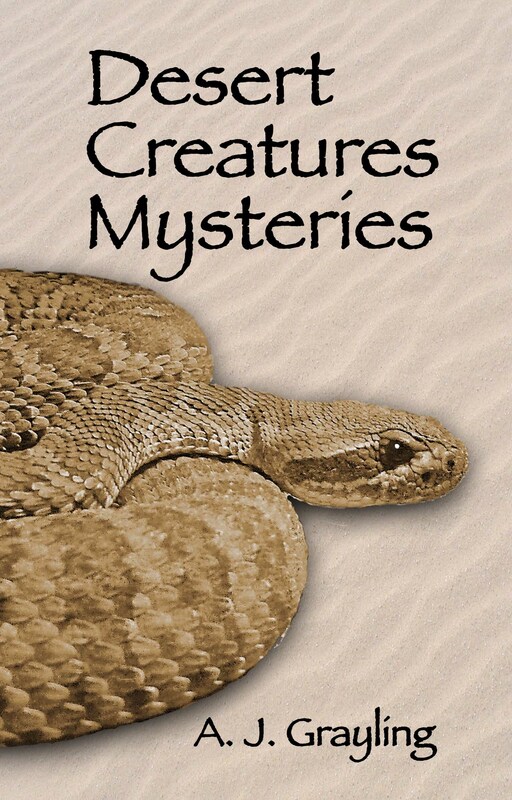 Posted in Biology, Desert, Fauna, Flora, Geology, Heat, Rain, Sonoran desert, Water | Tagged Desert, streams, wetland | Comments Off on What are Desert Wetlands? Here’s one way to encounter caliche. Some friends pulled over one night in the New Mexico desert and camped in their truck. Happily for the desert, there was rain in the night. Unhappily for the humans, the next morning they found themselves surrounded by a huge pond of extremely slippery ankle-deep goo. Only after a long dirty struggle were they able to push their truck back onto the road. Caliche is what allowed a mudbath to form in the middle of the desert. Another way to discover caliche is to dig a hole almost anywhere in the desert. Soon, inches or feet deep, you’ll hit a layer of what seems to be cement, even in places where you know there’s never been any construction. What you’ve found is caliche, a white layer of soil, rich in calcium carbonate, clay, and other minerals that have been driven down into the ground by the hard infrequent desert rains, until the minerals form an often impervious layer of soil, also known as hardpan. Wikipedia can tell you more. When rain falls on an area with dense caliche, rather than sinking into the soil, the water runs off, if it can find a channel, sometimes causing the surprising desert flash floods, because so little water is absorbed into the ground. Or it puddles up, creating a sea of mud. Digging a simple hole can require a pickaxe. Since the calcium carbonate can be alkaline enough to harm plant roots, planting in an area with caliche means that you may have to add conditioners as well as nutrients to the soil– and make sure there is drainage, even if that means digging a drainage hole through the caliche. The Arizona Master Gardener, a great source of information, gives details of how to deal with it. Tour images of the desert in spring. 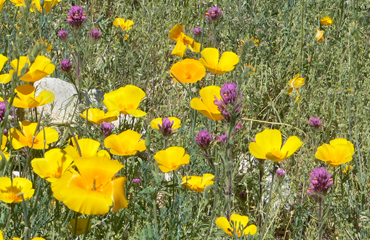 Early spring in Sonoran Desert mountains.